Tell your stories with Canon’s range of home photo printers. Stylish, compact Wi-Fi photo printers that fit perfectly in the home and deliver outstanding quality results, every time. Small, affordable and connected family All-In-One for simple home printing and scanning. For long lasting high quality prints, trust genuine Canon engineered printer inks. Save on genuine Canon inks with high yield XL and XXL cartridges and multipacks. Find the right Canon photo paper to suit your needs with a wide choice of finishes and sizes. Discover the wide range of connectivity and photo print options that PIXMA printers can bring to your home. Print all your stories with ease using the Canon PRINT app. Simply download it for free and you can print, copy and scan any way you want with effortless Wi-Fi connectivity to all your iOS and Android devices. PIXMA printers let you quickly get instant printer status updates and maintenance messages on your smart device when you connect via Bluetooth® technology*. PIXMA Cloud link lets you print photos and documents in seconds from social media and cloud storage like Facebook, Dropbox, Google Drive and Instagram direct from the printer screen or via the Canon PRINT app Plus instantly upload scanned pdfs and jpegs directly to cloud services**. A compact, desk-friendly All-In-One with touchscreen and multiple connectivity options. A compact everyday All-in-one colour printer, scanner and copier ideal for home use. An All-in-one colour printer with Wi-Fi connectivity and cloud features, great for home users. Connect with smart devices using this compact Wi-Fi All-In-One for high quality print, copy and scan. High performance photo printer with 5 individual inks, Wi-Fi connectivity and smartphone printing. Enjoy stunning, high quality photo prints with Wi-Fi connectivity. 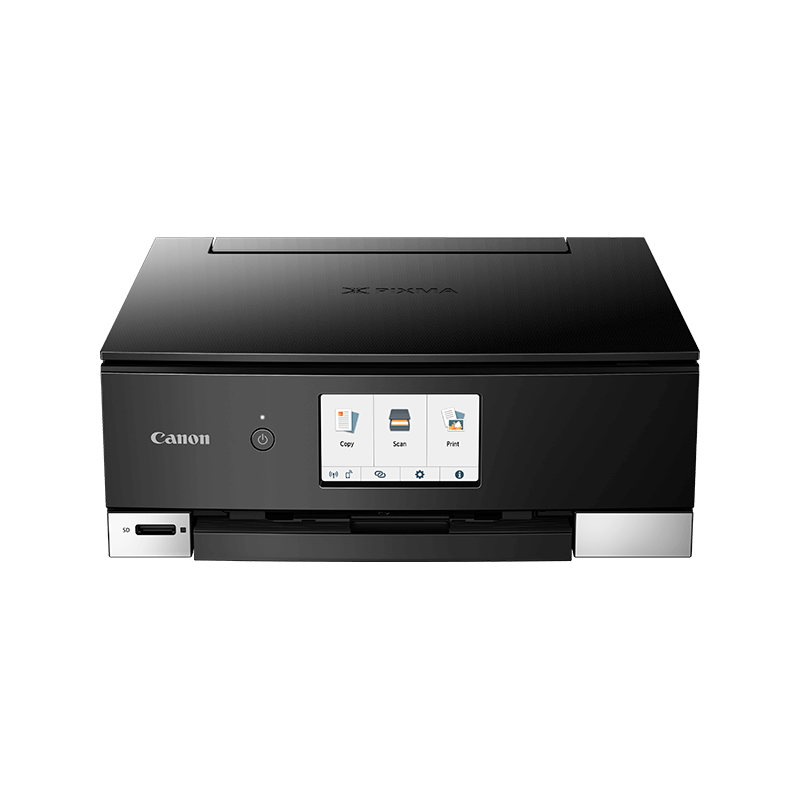 High performance, ultra-compact A3+ printer with 5-single inks, Wi-Fi and Ethernet. Explore our range of Home Office printers and All-In-Ones to find the best solution for you. Download drivers, software and manuals; access online technical support, resources and troubleshooting. Find the right ink tank or cartridge and paper for your printer with our consumables finder. Find the best printer for your home or office with our printer selector. *Equipped with Bluetooth® technology (Bluetooth print and scan is only available on Android devices). The functions available with Bluetooth communication and the Canon PRINT Inkjet/SELPHY app are not guaranteed on all Android smartphones. The Bluetooth® word mark and logos are registered trademarks owned by the Bluetooth SIG, Inc. and any use of such marks by Canon Inc. is under license. Other trademarks and trade names are those of their respective owners.